The farm is 10 Hectares, or 25 acres with an easement up to several natural jungle platforms presently with abandoned cacao trees that can be removed without issues with MINAE. Surrounding those cacao groves are lush topical forests with some spectacular trees and an active Quebrada named Ortiz that draws the birds and monkeys year around to the clean water that constantly flows and is fed by the surrounding jungle. Behind the farm is only virgin rainforest all the way North and East to the Paquita River. Since the road dead ends at the river, NO traffic drives by hence no road dust or traffic noise. We installed the water and electricity from the main road a kilometer away. The only neighbors are pineapple and vanilla farmers and Palma Tica, all of which are zoned only for agriculture. 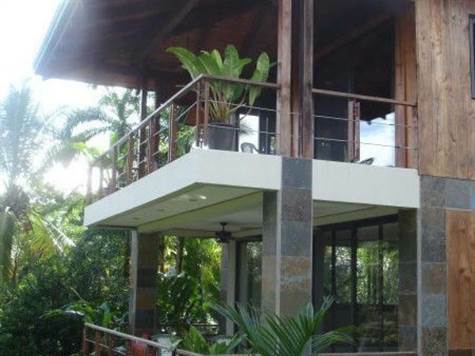 It has great potential for a retreat development with only a 20 minute drive to the Inter American highway and Quepos, and minutes from shopping and other services in Naranjito. No phones yet, but good cellular range. The duplex can easily be converted into a spacious two-story/four bedroom, 3 bathroom house, including 4 balconies, and all the utilities to install a pool and guest houses with ample water pressure tanks and sanitation to handle expansion already installed. It also has on-demand gas water heaters, separate meters and laundry, and all the provisions to install mini-split AC systems, but we have completely insulated the roof and have about $35,000 in quality European insulated sliding glass doors and windows that were custom made to keep the place comfortable and both Italian and Spanish slate floors and counters.